A Cape Town District Six Museum tagged image from photographer – wallyg as published on Flickr. The National September 11 Memorial, designed by American architect Michael Arad of Handel Architects in conjunction with landscape architecture firm Peter Walker and Partners, was formally dedicated on September 11, 2011, commemorating the tenth anniversary of the attacks. Arad and Walker’s design was selected from 5,201 entries in an open, international memorial contest, initiated by the Lower Manhattan Development Corporation (LMDC), as per the specifications of architect Daniel Libeskind. Two reflecting pools, each about an acre in size with 30-foot waterfalls–the largest manmade in waterfalls in North America–cascading down their sides, are set within the footprints of the original Twin Towers. 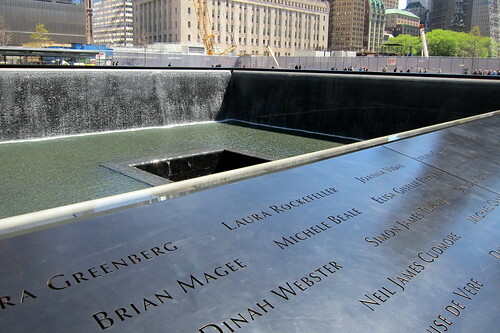 The names of 2,983 victims are in inscribed on 76 bronze plates attached to the parapet walls that form the edges of the memorial pools, arranged based on "meaningful adjacencies"–an algorithm developed by Local Projects which includes proximity at the time of the attacks, company or organization affiliations for those who worked at the World Trade Center or Pentagon, and approximately 1,200 requests from family members. The Memorial Plaza surrounding the pools provides a contemplative escape, with a grove of more than 400 swamp white oak trees, each selected from nurseries within a 500-mile radius of the three attack sites. A small clearing in the grove, known as the Memorial Glade, designates a space for gatherings and special ceremonies. The National September 11 Memorial Museum Pavilion, designed by Craig Dykers and Kjetil Thorsen of Snøhetta, is scheduled to open on or around September 11, 2012. The museum will feature over 110,000 square feet of exhibition space telling the story of the 9/11 through multimedia displays, archives, narratives and a collection of monumental and authentic artifacts.